Evian is not just a bottled water company. And the town of Évian-les-Baines in France on the south shore of Lake Geneva is not just a location for luxury hotels. It's also the location where, in July 1938, the first international effort was ever made (or feigned) to alleviate a refugee crisis. The crisis was the Nazi treatment of Jews. The representatives of 32 nations and 63 organizations (plus some 200 journalists covering the event) were well aware of the Nazis' desire to expel all Jews from Germany and Austria, and somewhat aware that the fate that awaited them if not expelled was death. The decision of the conference was essentially to leave the Jews to their fate. (Only Costa Rica and the Dominican Republic increased their immigration quotas.) The decision to abandon the Jews was driven primarily by anti-Semitism, which was widespread among the diplomats in attendance and among the publics they represented. Australian delegate T. W. White said, without asking the native people of Australia: "as we have no real racial problem, we are not desirous of importing one." "Popular support was reflected in various newspapers," writes Laffer. "Foreign correspondent, columnist and Pulitzer Prize winner Anne O'Hare McCormick described the 'heartbreaking' scenes of long lines of Jews seeking visas from U.S. Consulates abroad while 'waiting in suspense' for the outcome of the Evian Conference. She believed that the issue facing America and the world was not how many 'unemployed' could be added to the national rolls of the unemployed. Rather, the world faced a fundamental 'test of civilization.' Could America accept the moral guilt, McCormick asked, if Germany was allowed to continue with its blatant 'policy of extermination' of the Jewish people?" America chose the moral guilt, although it avoids awareness of it. America's Coast Guard chased a ship of Jewish refugees away from Miami. America's State Department turned down the visa application of Anne Frank's family. America rejected the Wagner-Rogers bill to admit more Jewish and non-Aryan refugees, but passed the Hennings Bill to allow unlimited numbers of British Christian children into the Land of the Free. A June 1938 Gallup poll found that seventy-two percent of Americans believed "we should not allow a larger number of Jewish exiles from Germany into the U.S."
"Hitler responded to the news of the conference by saying essentially that if the other nations would agree to take the Jews, he would help them leave: "I can only hope and expect that the other world, which has such deep sympathy for these criminals [Jews], will at least be generous enough to convert this sympathy into practical aid. We, on our part, are ready to put all these criminals at the disposal of these countries, for all I care, even on luxury ships." This is how Walter Mondale has described the hope represented by the Évian Conference: "At stake at Evian were both human lives -- and the decency and self-respect of the civilized world. If each nation at Evian had agreed on that day to take in 17,000 Jews at once, every Jew in the Reich could have been saved. As one American observer wrote, 'It is heartbreaking to think of the " desperate human beings " waiting in suspense for what happens at Évian. But the question they underline is not simply humanitarian " it is a test of civilization.'" 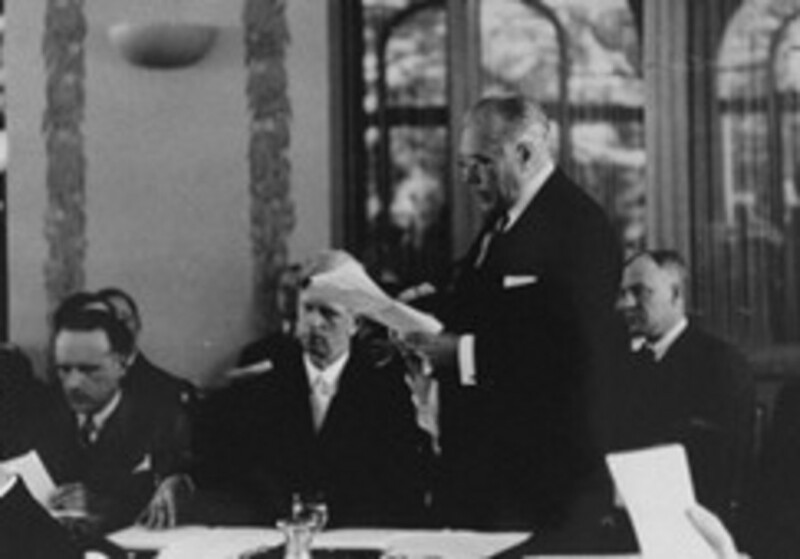 A report suggests that "the fact that the Evian Conference did not pass a resolution condemning the German treatment of Jews was widely used in Nazi propaganda and further emboldened Hitler in his assault on European Jewry leaving them ultimately subject to Hitler's 'Final Solution to the Jewish Question.'" The U.S. Congress also failed to pass such a resolution.